123-Reg, the UK’s largest domain name provider, will join the national enterprise campaign StartUp Britain on a country-wide tour this summer to support thousands of aspiring entrepreneurs. 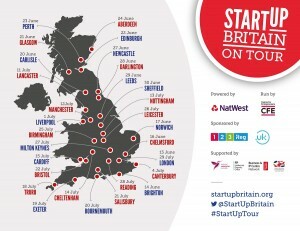 Now in its fifth year, the StartUp Britain bus tour, powered by NatWest and sponsored by 123 Reg and the .UK domain name, will visit a record 30 towns and cities in the space of six weeks. On-board, aspiring and early-stage entrepreneurs will be able to take the 123 Reg digital skills survey; trial 123 Reg’s new digital online training platform, and receive a free .uk domain and £100 discounts on its new industry leading Website Builder, specifically built for small businesses. Visitors will also have the opportunity to receive free, impartial advice on digital solutions for business from a 123 Reg ‘on-board expert’. Matt Smith, Director of the Centre for Entrepreneurs and StartUp Britain, said: “Mastering digital skills, operating a website and marketing online are important for entrepreneurs at any stage of growth, so it’s fantastic to have 123 Reg join the StartUp Tour to give free advice across the country”. The StartUp Tour is part of an ongoing partnership between the Centre for Entrepreneurs – which runs StartUp Britain – and NatWest that takes a beautiful 1966 Routemaster bus, owned by the bank, across the country to promote entrepreneurship. Parking in high-footfall town squares and offering free, advice, the bus tour celebrates entrepreneurial communities across Britain and inspires individuals to turn their business ideas into action. The StartUp Tour will have a distinctly local flavour this year, with energetic entrepreneurs recruited in each town to get on board and give advice. They will be joined by local specialists including accountants, lawyers and professional business advisers. Also on-board will be representatives of national partners including the Intellectual Property Office, the National Enterprise Network and the British Library Business & IP Centre Network. Julie Baker, head of enterprise at NatWest, said: “Our mobile business bus is a great way to get into local communities and support aspiring business owners. By collaborating with StartUp Britain, 123-Reg and local experts, we hope to provide a broader range of support to help more entrepreneurs realise their business ambitions than ever before”. 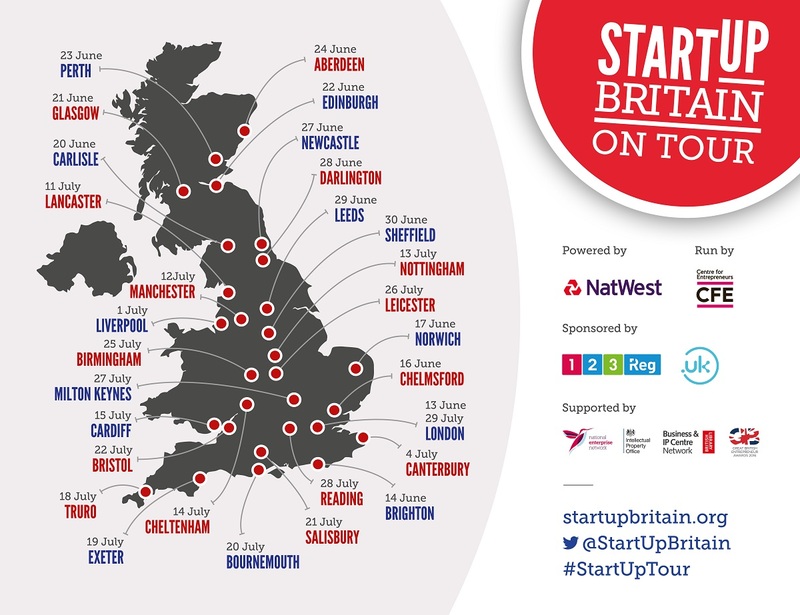 The StartUp Tour is set to visit 30 locations across England, Wales and Scotland, starting in London on 13th June and returning on 29th July. The bus will be parking in a range of prominent positions including Victoria Square in Birmingham, Queen Street in Cardiff and Piccadilly Gardens in Manchester. It will also be visiting Liverpool ONE, Glasgow’s Buchanan Street, Salisbury, Perth, Bristol and Norwich, among many others.